At Mid-West Metal Products we bring over ninety years of experience to our custom store fixture engineering and design services. For the convenience of our customers, we also maintain an inventory of our most frequently requested stock fixturing units and components. We have the ability to work with both wire and sheet metal, and can integrate both into a single POP display, wall unit, or free-standing/floor unit. We can also incorporate wood and plastic into store fixturing as desired. In addition, we have tube forming and both manual and robotic MIG welding capabilities. We have an entire facility dedicated to powder coating, as well as longstanding relationships with a variety of nearby, high-quality platers and finishers. These capabilities and partnerships allow us to furnish zinc plating, electro-polishing, heat treating, or other desired coating or treatment. Additional available services range from assembly and special packaging to bar coding and drop shipping. 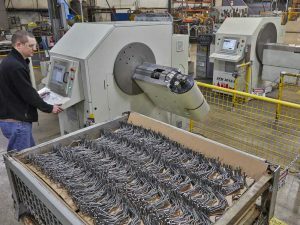 For more information about our custom store fixture fabrication capabilities, or our other products and services, please contact Mid-West Metal Products Co., Inc.